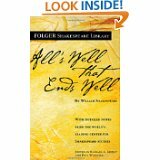 This is a study guide for the book All's Well That Ends Well is a play written by William Shakespeare. It is believed to have been written between 1604 and 1605, and was originally published in the First Folio in 1623. Please click on the literary analysis category you wish to be displayed. Back and Next buttons can guide you through all the sections or you can choose to jump from section to section using the links below or the links at the left.